Today we are going to visit Germany, where design professionals Huf Haus GMBH have created a futuristic home that manages to merge the modern and the sleek with the comfortable and the cosy. 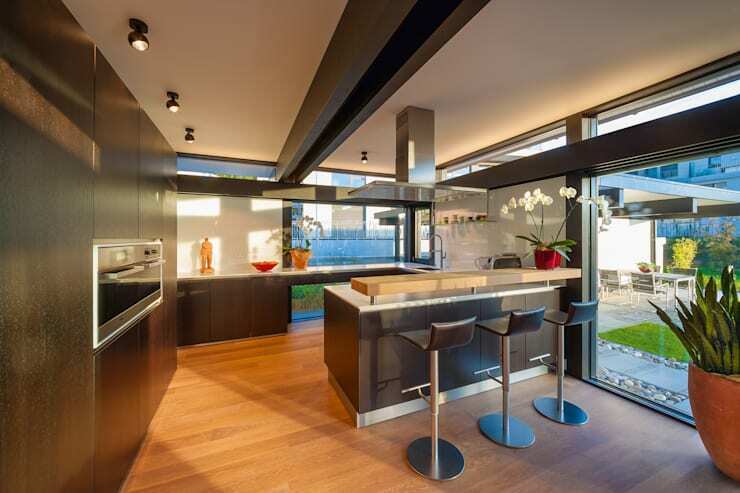 As we explore this home, we will see how contemporary design is going in a wonderfully environmentally-friendly direction, while still managing to remain incredibly cutting-edge and aesthetically appealing. 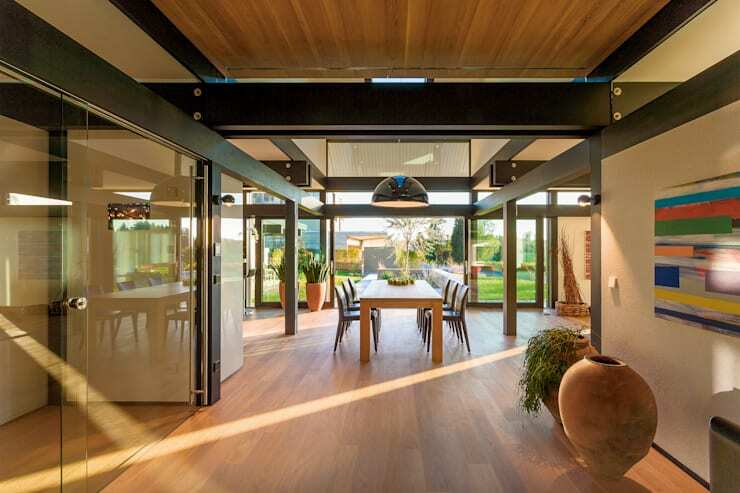 We will go room to room in this house and also see how natural light plays such a big role in modern architecture as well as how simple can sometimes be the most effective. This design will inspire you to reach for more futuristic designs in your own home, whether subtly or more dramatically. 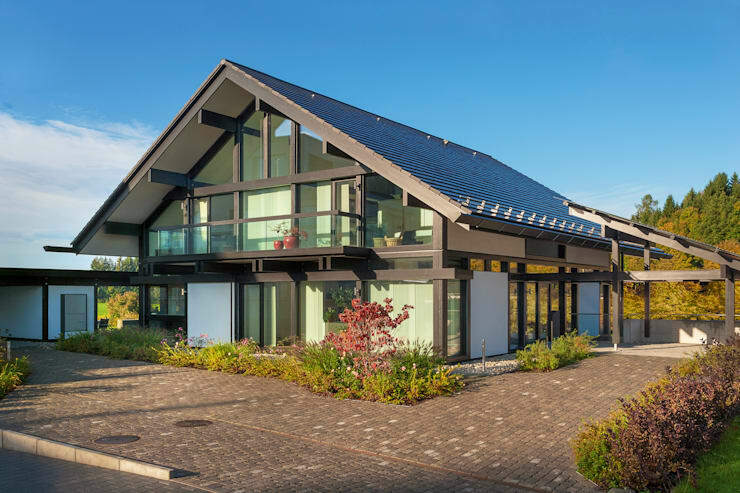 It's a double-storey design with a traditional gable roof, but the facade is mostly made of glass, creating a stunning visual effect. If we look a little bit closer, however, we can see that there are white walls interspersed in the glass facade, offering the family some privacy without compromising on the cutting-edge design. The glass facade as well as the outdoor spaces and the upstairs balcony ensure that there is a constant dialogue between the interior and exterior spaces. From this angle, we can see how the gorgeous landscaped garden contrasts beautifully with the modern architecture. If we look at the roof a little bit more carefully, we can see how solar panels line the entire section of the roof. 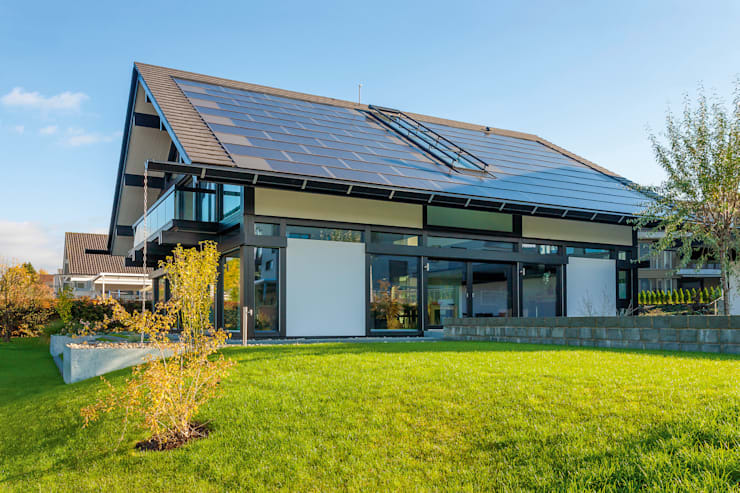 This allows the home to be solar-powered, which makes for a very sustainable and green home. Often we think that green homes aren't going to be very attractive, but here we can see that this is simply not the case. Expert professionals can ensure that environmentally sustainable features are incorporated flawlessly into a stunning design. If we head inside the home, we can see how an open plan design creates a very attractive, spacious and striking interior. The glass facade ensures that this space is flooded with natural light throughout the day, warming it up and making it that much more inviting. The wooden floors have been carefully chosen to work in harmony with the natural light, creating a very earthy and homely look and feel. This is complemented by the pot plants that have been dotted around the home, bringing greenery and a refreshing form of the decor to the space. As we can see in the dining room, there is very simple and functional furniture used in the home. If we look at the dining room a little bit more carefully, we can see how a wooden dining room table is flanked by black dining room chairs. The colour palette is neutral and subtle. A very trendy large lampshade is suspended over the dining room table, adding a funky and edgy form of decor to the space. This is also a very functional element, allowing the diners to see what they are eating, while still creating ambiance and a wonderful mood in the dining area. This is a great tip! For inspiration when it comes to your dining room, have a look at this ideabook: Dine in style with these dining room revamps. The living room is just as futuristic and trendy as the rest of the home, with black and white leather sofas and a very cosy looking grey rug, which works in harmony with the wooden floors. In this space, we can see how the designers have added a splash of colour to the room in the form of plump red cushions and a red armchair. This is a great design tip! Opt for a neutral colour palette in a room and add some colourful features to spruce a space up. When you get bored of the colours, you simply have to swap around the cushions! 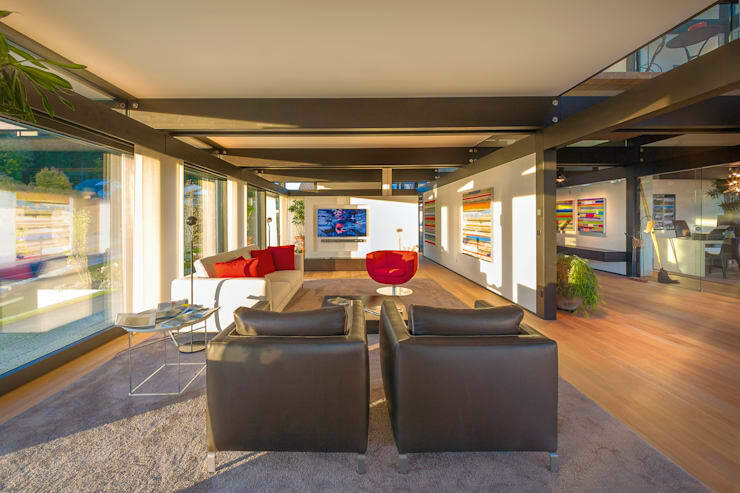 The living room is also evidence of what an impact artwork can have on a home. It introduces personality and vibrancy to an interior design, as well as reflects the homeowners' interests. The kitchen in this home is very sleek with its grey tones and silver appliances. The vases of flowers and plants soften the look and feel, breathing new life into the kitchen area. What's important to draw inspiration from is the savvy kitchen bar, however. Flanked with bar stools, this is a wonderful more casual space for the family to come together in the mornings or the afternoons over breakfast or cups of tea. It also means that the chef can have some company while he or she cooks. This is a very classic and timeless design! The bedroom is one of the most sophisticated rooms in the house, with an entire wall made from glass. Curtains ensure that there is privacy in this space, while still allowing for sunshine to flow into this room at all times in the day. The designers have worked with the sloped roof, using it to their advantage to create quite a dramatic design. The minimalist tones see only the most functional of furniture used in the room, including a bed, bedside tables and a cabinet. This makes for a very serene and peaceful space, which becomes a cocoon for the residents! Don't you love how even the bedroom features a lush pot plant too? This is our favourite room in the house! 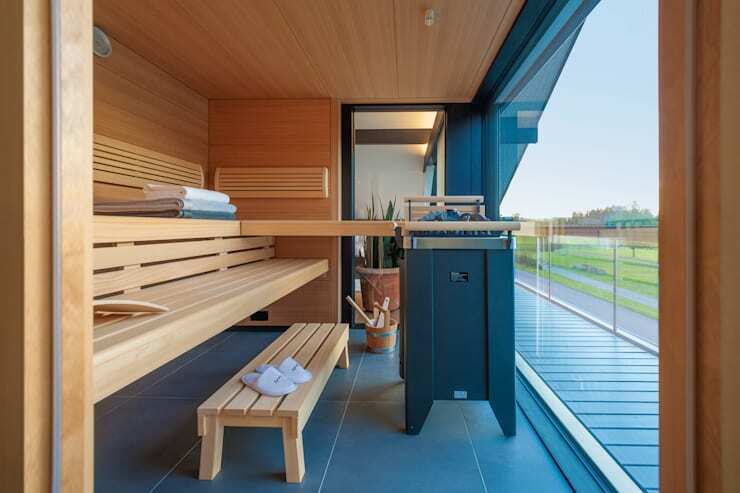 With the space available to them, the designers installed a sauna room in the home that overlooks the entire landscape around the house. This is an area where the family can go and relax, meditate or just have some quiet time. It's also easy to construct! With some wooden benches and tiled floors, a room can very easily become a sauna, adding a bit of luxury to a home. 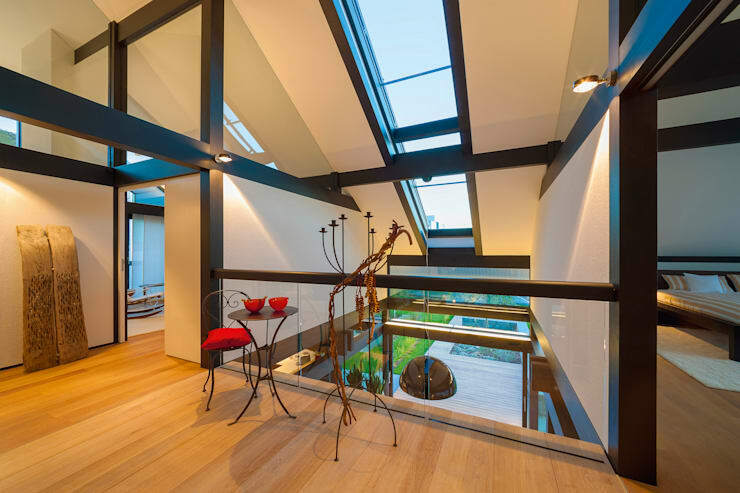 One of the easiest ways to fill your home with natural light is to install skylights throughout the ceiling. In this image, we can see how much of an impact it makes! The upstairs landing of the home is bright, spacious and light thanks to these skylights, making for a very appealing interior design. The last thing that you want is your home to look dark and dingy. If you have lots of natural light in your home, you can also afford to have some darker colours in the form of furniture and artwork—a good tip to remember! 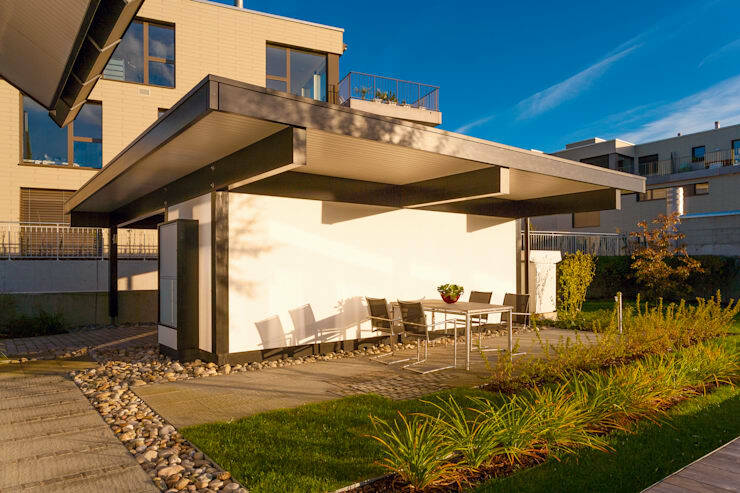 We end off our tour outside the home, where we can see how the designers have created a very simple yet stylish outdoor dining spot that is covered by a roof, but still manages to receive fresh air and sunshine. If you have a garden or terrace area, it is always a good idea to include a comfortable chair or two and a table if possible. This allows you and your family to really enjoy the outdoor space, for meals, for reading a book or for sipping on cocktails as the sun goes down. Make sure that you opt for durable furniture, however, which will last in all weather conditions! This is a home that is very stylish and savvy, while remaining comfortable and cosy for the family. If you like this home, you'll love this: Fantastic futuristic home. What do you think of this futuristic home?